The story “The Necklace” is about the fact that even a small thing can change the life of a person. Chance or fate plays very important role in human life. It is more powerful than human resolution. It is man’s destiny. Mathilda is the central character of the story. She was very pretty. She thought that she was born in the family of clerks by the error of destiny. Her husband, Losiel was also a clerk. She believed that she was born for all the luxuries of life. She did not like her poor house. She always dreamed of a big house. One day her husband brought an invitation card for a ball at the residence of the Minister of Education. She was not happy at the invitation because she had no good dress to wear at the party. Loisel gave her 400 francs to buy the dress. However, she was still unhappy. Now she wanted some jewels to wear. She went to her friend to borrow some jewel. She borrowed a necklace. She went to the party and enjoyed it. On her return, she lost the necklace. Her husband tried to find it but failed. Later they borrowed money and bought a new necklace to replace the lost one. Now Loisel worked day and night to return the borrowed money. Mathilda discharged the maidservant and did everything of the household by herself. 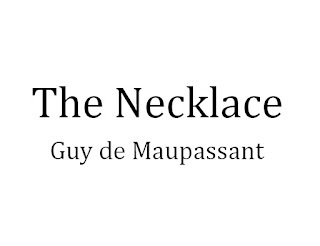 The story “The Necklace” is a superior work and its plot is conceived in terms of an affecting ironic reversal. Discuss. No doubt, the story “The Necklace” is a superior work of art and its plot has been conceived in terms of an affecting ironic reversal. First, when we go through the story, we find that Mathilda was not satisfied with her life. She was very beautiful and thought that she was born for all delicacies and luxuries of life. Therefore, she wanted to marry a rich man. However, it is ironic reversal that she was married to a poor a petty clerk against her wishes. Secondly, she always dreamed living in a palace. She thought of big houses having eastern construction and luxuries. However, her expectation of living in a big house did not come true. She got a poor apartment. Ironically, she had to leave that apartment too. She had to rent some rooms. Thirdly, she thought that she was born for all delicacies and luxuries. However, what did she get? She had to send away the maidservant. She had to wash the dishes. She had to wash clothes. She lost her beauty and ten years of her life. She had become the poor household woman. She seemed older now. 2. How singular is life and how full of changes! How a small thing will ruin or save one,” Mathilda thinks. Do you agree? In the drama of human life, chance or fate, sometimes, is more powerful than human resolution. It is man’s destiny. Do you agree? How was chance, luck, or fate at the basis of the suffering of Mathilda and Loisel? Yes, I fully agree that a small thing or a chance or fate can ruin or save a person. Chance is more powerful than human resolution and it is man’s destiny. When we go through the story carefully, we find that Mathilda’s life was going on very well. Although she was not satisfied with her life, het she was living better than most of the middle class women. She had a loving husband. She had a maidservant who did everything for her. She was very beautiful and looked out of her dress. All this suggests that her life was all right. Now chance played its role and changed all her life. Her husband brought an invitation to the ball at the Minister’s residence. She had no jewel to wear on the party. She went to her friend and borrowed a necklace to wear. She was very happy, but a small thing happened. She lost her necklace. It was necessary to replace that necklace. Her husband borrowed the money from every possible source and brought the necklace. Chance again played its role. When she went to return the necklace, her friend did not open the jewel box. Actually, the necklace she had borrowed from her friend was false and she was returning the real one. If she had opened the jewel case, she would have come to know that fact and Mathilda would have been saved from future sufferings. However, chance or fate did not let her friend open the jewel case. Now their life changed and they lost everything. 3. It is said that Madam Loisel was responsible for her tragedy. Do you agree? When I read the story “The Necklace”, I quite agree that Madam Loisel was responsible for her tragedy. Firstly, she should have accepted the fact that she was a poor woman and she would be misfit among people of high class. She was completely wrong when she thought that she was born of all delicacies and luxuries because she was the wife of a petty clerk. Her high ideas about the luxuries of life were the first reason of her tragedy. She should not have gone to the ball. It was her mistake. Secondly, she should not have borrowed the necklace from her friend. This was her second mistake and it was the main reason of her tragedy. Wearing that necklace, she wanted to make a show of her riches. Thirdly, she acted quite carelessly. She should have taken great care of the necklace. However, she was in a world of dream. This was what she always wanted. At that time, no one and nothing had any importance for her. She had even forgotten her husband. That was her third mistake. She lost the necklace because of her carelessness. Fourthly, she should have told her friend that she had lost her necklace. If she had told her friend about the loss of the necklace, she would have come to know that the necklace she had borrowed was false. In this way, she would have been saved of her tragedy. It was her greatest mistake. 4. It is said that Mr. Loisel was also responsible for his and his wife’s tragedy. Do you agree? When I go through the story “the Necklace”, I agree that Mr. Loisel was also responsible for his and his wife’s tragedy. Firstly, Mr. Loisel should not have brought the invitation to the ball. He knew that he was only a clerk and he would be quite misfit among the people of high class. However, he wanted to please his wife. When his wife told him that she did not have anything to wear, he should not have insisted on going to the ball. It was a great mistake on his part. He should have dropped the idea of going. However, he did not do so. Secondly, he should not have advised his wife to borrow some jewel from her friend. His wife did not have any idea about that. It was his second great mistake. Thirdly, when the necklace was lost he asked his wife to tell a lie. He asked her to write to her friend that she had broken the clasp of the necklace and she would have it repaired and then return it. Now it was his greatest mistake because it resulted in his and his wife’s tragedy. 5. 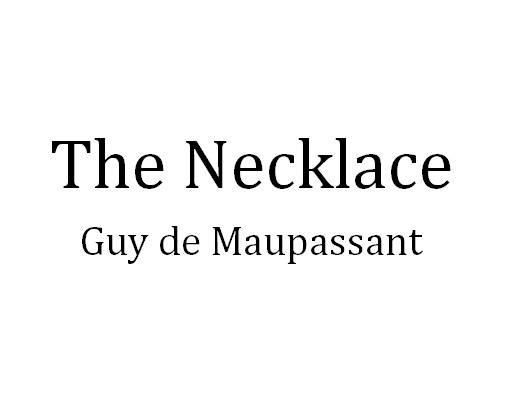 What is the theme of the story “The Necklace”? 6. “The necklace” is a tragedy. Discuss. In the light of the above definition, when we read the story, “The Necklace”, we find that Mathilda was higher in the sense that she was very beautiful. She suffered because of her four mistaken acts. Firstly, her high ideas about the luxuries of life were the first reason of her tragedy. She should not have gone to the ball. It was her mistake. Secondly, she should not have borrowed the necklace from her friend. This was her second mistake and it was the main reason of her tragedy. 7. What is the moral of the story “The Necklace”? There are at least three lessons or morals in the story “The Necklace”. The first lesson is that we should be contented. We should learn to live according to our circumstances. When we read the story careful, we find that Mathilda was very beautiful. She was not contented. She thought that she was born for all the luxuries of life. She wanted to live in grand houses. She wanted to marry a rich man. That was why she was always depressed. She did not enjoy her household life and food. When her husband praised the food, she thought of elegant dinners. She had neither frocks nor jewels and she felt that she was made for them. Therefore, she suffered for ten long years for her high ideas. No doubt, we should have high ideas but we should cut our coat according to our cloth. The second lesson is that we always suffer if we try to get happiness through borrowed things. Shakespeare was right when he said that neither a borrower nor a lender be. Mathilda should not have borrowed the necklace from her friend. In this way, she should have been saved from her tragedy. 8. Write a note on the vanity of Mathilda Loisel. No doubt, Mathilda Loisel was proud and self-loving. She was very beautiful and charming and she was proud of her beauty. Because of this beauty, she thought that she was born in a family of clerks through the error of destiny. She felt that she was born for all delicacies and luxuries. She also felt that she was made for expensive frocks, jewels and other such things. As she belonged to a family of clerks, she was married to a petty clerk, but she was not happy at this marriage. She thought that she was out of her class and she belonged to upper class. That was why she did not like the poverty of her house. She thought that because of her beauty she had a right to live in a grand house. This house should have graceful furniture, footmen, and perfumed rooms. She wanted to chat with rich friends at five o’clock in those rooms. When she and her husband sat to eat, she did not enjoy the food. Her husband praised the humble food but she thought of elegant dinners. She imagined that she would enjoy the food with a smile. There would be expensive wall cloth on the walls. 9. How did Mathilda lose the necklace and what efforts did Loisel make to search it? What caused the loss of the necklace? When we read the story “The Necklace” carefully, we find that Mathilda might have lost the necklace in the cab or somebody might have stolen it during the party. The thief might have thought that it was a real and expensive necklace. Mathilda was very careless about the necklace. She enjoyed the party. Her greatest desire had come true. She was in a world of dream and she had forgotten everything, even her husband. Therefore, it was probable that either someone had stolen it during the party or she might have dropped it there. She might not have lost it on the road. If she had dropped it on the road, she, and her husband would have heard it fall. Therefore, if she had not lost it at the party she might have lost it in the cab while returning home. When they found out that Mathilda had lost the necklace, they looked in the folds of the dress and in the pockets. In short, they searched for it everywhere, but could not find it. 10. What did Loisel and Mathilda do to buy a necklace to replace the lost one? When they could not find the necklace, they decided to get some more time. First Mathilda wrote to Madam Forestier that she had broken the clasp of the necklace and she would return it after getting it repaired. In this way, they got some time to search the necklace but they could not find it even after one week. Now they decided to replace the necklace. They took the box of the necklace to the jeweler whose name was written inside the box. However, he told them that he had not sold that necklace; he had only supplied the box. Then they went from jeweler to jeweler to find a necklace like the lost one. At last, in a shop they found a necklace that seemed like the lost one. Its value was forty thousand francs, but they could it four thirty-six francs. They begged the jeweler not to sell the necklace for three days. They hoped that they would the necklace. Therefore, they arranged with the jeweler that if they found the lost necklace before the end of February they would return the necklace in thirty-four thousand francs. 11. How did Mr. Loisel and Mathilda suffered to return the borrowed money? To return the borrowed money Mr. and Mrs. Loisel suffered for ten long years. First, they sent away the maidservant. Then they changed their lodging and rented some rooms. Now Mathilda learnt heavy cares of household life. She had to do the difficult chores of her kitchen. She had to wash dishes, greasy pots and stew pans. She had to use her rosy nails to wash the greasy pots and the bottoms of the stew pans. She had to wash dirty clothes and to hang them on the line to dry. Then each morning she had to take down the refuse to the street. She also had to bring up the water for daily use. She had to stop at each lending to breath. She did not have much money so she haggled with the shopkeepers to get reduction in prices. Once she was very beautiful and used to wear beautiful dresses. Now she seemed old. Now she looked a common household woman. She had badly dressed hair and dirty dresses. Her hands were red and she spoke in a loud tone. She washed the floors in large pails of water. Mr. Loisel had to work in the evenings after his office hours. He put the books of some merchants in order. At nights, he did copying for five sous a page. 12. Was the necklace real or fake? How Mathilda come to know of this? Discuss the end of the story. Reproduce the talk between Madam Loisel and Madam Forestier. On one Sunday Madam Loisel was taking a walk to free her of the cares of the week. Suddenly she saw Madam Forestier who was also taking a walk with a child. She decided to talk to her. She was meeting her after ten years. Now that she had paid up for the necklace, she could talk to her without any fear. She approached her and said good morning to her very frankly. However, Madam Forestier could not recognize her because Mathilda had changed completely. She was not beautiful any more. She looked an ordinary poor woman. On the other hand, her friend was looking young and attractive. Madam Forestier said that she did not know her and she must be mistaken. Mathilda introduced herself. Madam Forestier was surprised. She told her that she had changed very much. Mathilda told her that she faced many hardships because of Madam Forestier. She reminded her that she had borrowed a diamond necklace from her and then later lost it. She told her friend that she had returned her another necklace. She was happy because she had paid all the borrowed money. Madam Forestier asked her if she had returned her a real diamond necklace. When Madam Forestier came to know that it was real, she was greatly moved. She took Mathilda’s both hands and told her that her necklace was not real and it was not worth over five hundred francs. 13. Write a note on the cultural background of the story. The writer has satirized the French life of his time. The writer has reflected the life style of French people of his time. Discuss. When we read the story carefully we find that the story as a strong cultural background. The writher has presented woo classes of people – middle class and the upper class. There was a great gap between the two. The people of high class were enjoying all the luxuries of life. They had ball parties. They enjoyed themselves by dancing, chatting, and playing indoor games. They wore fake jewellery. However, they tried to show off that they were wearing real and expensive jewellery. Madam Forestier’s fake diamond necklace proves this point. They made a show of their costly dresses. They were so carefree that they enjoyed parties until late at night. On the other hand, people of middle class were suffering. They wanted to close the gap but could not do so. They suffered and because of these sufferings, they lost their beauty and looked old. On the other hand, rich people of the same age looked younger and more attractive. At the end of the story, we see that Mathilda’s rich friend of the same age was still beautiful and attractive. Want these notes in Word or PDF format for free to download?Please refer to the message box at right bottom of this blog.